James Bond has always been seen playing card games. He was first introduced playing Baccarat in 1962's Dr. No and has been playing cards ever since. The famous scenes involving 007 playing high-stakes card games have piqued the interests of Bond fans and card players alike. This passion for James Bond and cards has given rise to a few brand new games and revived interest in classic card games. James Bond is a fast-paced card game played with a standard 52-card deck of playing cards that involves two players racing to get six sets of matching cards before their opponent. This game is relatively new and great for families. Shuffle a standard deck of 52 cards thoroughly. Be sure to remove the Joker cards. Deal each player six stacks of four face-down cards. These stacks of cards are called "books." Deal the remaining four cards face up in the middle of the table where they are easily accessible to both players. When the game begins, players pick up one book and begin swapping cards in the book with the cards in the middle as fast as they can. Players do no take turns, as soon as a card is placed in the middle, either player can grab it as soon as it is laid down. Players can set one book down and pick up another book too look for more moves. Only one book can be held at a time, the other books remain face down. The goal is to have four cards of the same number or face in each book. The first player to have all six books contain four matching cards wins the game. When a player takes a card from the middle, they must replace it with a card from the book in their hand before taking any other action. When a player is not looking at a book they must place it face down on the table. The video below features a mother and daughter demonstrating the game. Top Trumps has been a best-selling card game franchise in England for the last 40 years. This card game allows kids to have a great time while engaging with critical thinking and basic mathematics. These cards are also a great memorabilia item for James Bond enthusiasts of all ages. Top Trumps involves a deck of 60 Top Trumps cards to be shuffled and dealt evenly between all players. All players then draw one card and the first player chooses a statistic on the card they just drew. One by one, the players declare the value of the declared statistic and the player with the highest value of the chosen statistic takes all the cards. This is repeated until one player has all the cards. The James Bond Top Trumps deck is available from the Top Trumps website and can also be purchased on Amazon for about $10. The video below shows how to play Top Trumps no matter which deck you are using. In 1995, the release of the James Bond movie Goldeneye coincided with the height of the mid-90s collectible card game (CCG) craze. Out of this frenzy, the ill-fated James Bond CCG was born. A total of 217 unique cards were printed featuring characters from all the James Bond movies. Unfortunately, many of the most common cards were plagued by misprints, typos, and alignment issues. These issues in manufacturing made the already boring game even more difficult to play, and the James Bond CCG was out of print by 1996. You can still purchase these cards second hand from certain websites, and some sealed booster packs are available on eBay. Additionally, a few fans have even gone so far as to create their own versions of the game with new rules and independently produced cards. 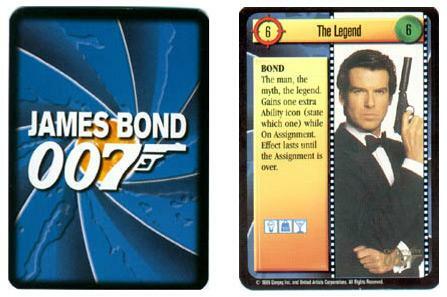 Rather than being used to play a game, the original cards are collector's items for only the most dedicated Bond fans. Baccarat is the game most famously associated with 007. As noted by the 007 Museum website, baccarat is featured in Dr. No, Thunderball, On Her Majesty's Secret Service, and GoldenEye. Baccarat is also of major importance in the Casino Royale novel and is often considered the most classic Bond casino game. Baccarat is a simple game that offers plenty of fun and excitement. In baccarat, there are only two hands per game: the Player hand and the Banker hand. Gamblers place a wager on one of three outcomes: Player win, Banker win, or tie. The hand that gets closest to equaling 9 wins the game. Check out this great video to learn the ins and outs of playing big baccarat, the style of baccarat played in Dr. No. In the 2006 release of Casino Royale with Daniel Craig, everyone's favorite super spy wasn't playing baccarat. Instead, he was playing no-limit Texas Hold 'Em. This was a change that left some fans scratching their heads and others excited to see the franchise keeping up with popular trends in casino games. Texas Hold 'Em is a very popular version of poker and is significantly more complicated than baccarat. Players are each dealt two cards face down that they keep secret. They play those cards along with five cards played face up in the middle of the table. Bets are placed after the first two cards are dealt, after the first three face-up cards are dealt, and again after the fourth and final cards are dealt. The video below explains how a hand of Texas Hold 'Em is played, and if you are brand new to poker, you can reference this list of poker hands to familiarize yourself with the different hands. Whether you happen to be playing a card game inspired by the James Bond movies or one of the games 007 plays himself, sitting down and enjoying a fun card game with friends and family is a great way to spend time!